Instagram is an amazing way to connect with people and make friends. I’ve been able to learn about new restaurants, get delicious recipes, be inspired by stunnng food photography, try new tasty products as well as meet the brilliant people behind all these things. One such wonderful group of people that I’ve met were the family behind Doulsi Dulce De Leche, a small batch dulce de leche business. Here they are (minus one), generously allowing me to take a snapshot. I met up with them on a trip to Adelaide recently and they shared the Doulsi story. They immigrated from Argentina over a decade ago, after falling in love with Australia during several trips. It was a tough move, not without its challenges, but they have thrived in South Australia. They created Doulsi because they wanted to rekindle fond memories of dulce de leche from their childhood. They aimed to craft a wholesome and artisanal milk jam, that tastes like it is meant to. The family is the business, all of them have a part to play, from engineering the specialized dulce de leche machinery, to creating fantastic recipes using the product in the kitchen, to running social media, web design and of course, making the dulce de leche. They are a busy and talented family of four! The dulce de leche itself is based on a traditional argentinian recipe and uses local milk, rather than the milk powder favoured by competitors, and big brands. It also has no preservatives, or colours, and Frank makes them in small batches of around 40 jars. After, eating my way through a jar of Doulsi way quicker than I care to admit, I can safely say that this point of difference truly makes the dulce taste lusciously rich and creamy. Check this out – dulce de leche is like caramel, but creamier, spreadable and less sweet. I’ve tried it with greek yoghurt, spread on toast with cacao nibs and even as a fruit dip (it tastes heavenly with bananas). The lovely Norma, who creates recipes and bakes the amazing treats you see on Doulsi’s Instagram, generously baked us some DELICIOUS palmiers sandwiched with dulce de leche. I’m also going to be doing some baking using Doulsi, which I will share on Instagram. If you are keen to find out more about dulce de leche and Doulsi, check them out here. I love sushi trains because I’m the kind of person who wants to try a little bit of everything. I get real FOMO when I look at a menu! Sushi Boto recently opened in St Collins Lane, and it is pretty special, as it is A BOAT, rather than a train. No really, the plates float in little blue boats in a moat. We were super lucky to be invited to check it out as guests of the restaurant. Sushi Boto’s design mixes sleek and futuristic with cute and quirky. For example, these cute cats surrounded by flowers! Here is a close up. Omg. Adorable, and they line the sushi boat, ready and posing for Instagram. As well as dishes floating on the sushi boat ($3.80 a plate), there is a special menu. They have some amazing sounding cocktails as well, but we don’t drink, so the lovely staff made us some yuzu sodas, which were perfect. We absolutely love yuzu, and will always order it when we see it on menu. These just looked too good not to try! Tempura battered chicken roll which was crispy on the outside with chicken that was full of sticky sweet flavour on the inside. Yum. Salmon nigiri is a great test to determine a quality sushi train/boat. This one was superb. There was a perfect fish to rice ratio. The fish melted in your mouth and the rice was soft but still held its shape. Plus it was the perfect temperature. There is nothing worse than nigiri that is too warm or that has been refrigerated so that the fish is tough/rice is hard. This luxurious masterpiece is off the Chef’s special menu – ‘Sushi step’ ($88). It is a 10 step sushi journey – leading your palate from milder sushi flavours up the steps to stronger, umami filled flavours. Each step was beautifully plated with fresh quality seafood. …followed by this gorgeous surf clam dish. Check out these colours! Then we stepped up to fresh sea urchin, then the most amazing Tasmanian salmon belly, on to dry aged salmon, crispy fried salmon skin, grilled cheesy hokkaido scallop, yuzu ponzu mix sashimi and Japanese Fois Gras with rice! Our faves were the Tasmanian salmon belly, which was fatty, rich, and delicious. Also the crispy fried salmon skin which was a crunchy fried umami stick. Lastly the yuzu ponzu mix sashimi salad, because we love everything yuzu! It was a seriously lux and fun way to taste the ocean. Something to order on a special occasion! PLUS AFTERWARDS WE GOT TO HIT THE CLAW/TOY MACHINES. Sushi Boto kindly gave us a token each, and we each got a keyring to take home. So cute! We really enjoyed our visit to Sushi Boto and 100% will be back again. The sushi was delicious, there were heaps of out of the ordinary, yummy looking dishes to try, the restaurant is super cute plus the staff were lovely. 279 is a recently opened, minimalist-style Japanese café which specialises in musubi and miso. We absolutely love Japanese cafes, and of course had to visit 279 as soon as possible. The interior of the café is white and bright; long and narrow, with light wood accents. We grabbed a spot at the front window to a view of Victoria Street in early afternoon autumn light. Friendly staff explained the menu, with helpful ordering suggestions. We ordered a few musubi, also known as onigiri, to share, as well as a miso soup each, and a small side. To drink we had a houjicha latte ($5.50). Complimentary sparkling water was also brought to the table. The latte was nice; perhaps it could have been a bit stronger and a slightly more generous serving, considering the price. Check our these gorgeous miso soups! We ordered a Shiro miso and an Awase miso, both with a bonito broth. I think the vegetables look like floating gems. So pretty! It was also fun trying both misos and comparing flavour profiles of each miso paste. Musubi were priced around $3.50 – $5+, depending on toppings. Pictured: Furikake musubi ( I love furikake in all forms), Salmon & salt musubi, ( could have packed more of a punch) and Pumpkin Oso-zai ( sweet and I wish there was more). As you can see, the food was presented simply but beautifully. Flavour-wise, it was quite simple too, paired back but still tasty. Favourites were the glazed miso musubi and the awase miso. You would think rice and soup would be quite filling and hearty, but the food was quite light. However, the bill had reached over $40, and we had had enough rice, so we left a bit hungry. We got the impression that the menu was geared towards snacks with coffee, rather than lunch, which is fair enough! So we recommend 279, maybe not for a big lunch, but for an afternoon snack with friends or a coffee paired with musubi to get you past 3:30-itis! In a search to find something for brunch other than eggs or smashed avocado, I found Brunswick based Sri Lankan cafe, Lankan Tucker. Lankan Tucker specialises in Sri Lankan fusion brunch fare, and their menu features curry, string hoppers, egg hoppers, roti and buriyani. We got some coffees and a hot choc to start off with, but the iced milo and faluda milkshake were very tempting. Our coffees were good, but my hot choc, which used Grounded Pleasures drinking chocolate, (pictured $5.80 for a mug) was a bit disapointing. The milk had been steamed to create lots of large bubbles, and I prefer velvety creamy hot chocolates. This was a refreshing dish with lots of texture – essentially sushi for breakfast. The wild rice was fragrant, chewy and filling. The egg/ fish and rice combo all together on the fork was fantastic. A creative and delicious dish. I had serious envy when this arrived at the table. That egg hopper looked incredible, and all the colours on the plate looked so inviting. My friend really loved this dish, and next time I visit Lankan Tucker, I will order this! This dish was warming, filled with texture and lots of different flavours. It was actually quite a light meal, even though there were so many elements. I loved the crunchy pappadums on top, the mix of veggie curries and how they tasted with the string hoppers. Yum! I recommend Lankan Tucker if you are ready to break out of the brunch mould and get something colourful, flavourful and different on your plate. Ever had a German brunch? I was recently invited to the launch of a Bavarian Brunch menu at German restaurant Hofbräuhaus. The restaurant interior is cosy, with lots of German style : wooden floors, waiters in traditional costume and beer barrels. There is beautiful light that comes through the windows, and you begin to feel like you are in Europe. However, we did think the music was too loud for a brunch atmosphere, as we struggled to hold conversation over it. The brunch drinks menu includes breakfast beer, and cocktails which match with brunch dishes, as well as your standard hot drinks. We opted for hot chocolates, as we don’t drink – but we think a german beer with a hearty brunch would be great for a hangover ( hair of the dog, etc). The food menu had heaps of traditional German breakfast dishes and all of them sounded delicious. We ordered a savoury dish and a sweet one. The Bauernfrühstück ($17.50) : Fried organic eggs (Willowzen Eggs) with pan fried potatoes, roasted tomato and Bretzel was a giant comforting meal. The potatoes had lots of salt, herbs and flavour and were topped with a perfectly fried egg. The egg yolk tasted amazing mixed in with the potato. PLUS there was a chewy fresh Bretzel with whipped butter. Check out this baby! My brunch partner, Mrs GFGK is a massive pretzel fan and she loved this one. The Kaiserschmarrn ($17.50) is described on the menu as a “result of a historical pancake accident”. It is a shredded pancake with berries, plum jam and whipped cream. This cut up pancake was pretty yummy, with crunchy sugar coated edges and lots of jam and cream – a real sugar hit. This Bavarian Brunch menu is the perfect remedy for a big Saturday night out : I can really see a bachelor party recovering here with some beers, german sausages and bretzels. Little Byrd is a cafe with soul. There is a warmth beaming from this cosy cafe that so many Melbourne cafes lack. The atmosphere was buzzing when we arrived, and diners were chatting to neighbouring tables, and dogs tails were wagging as they got extra scratches behind their ears. Rabih, the owner has built a hub for the northside community, with great coffee, and a beautiful menu with a middle eastern twist. Beautiful latte art on a delicious coffee. An every fruit on the list freshly made juice – refreshing and healthy. The flower is such a cute touch. Check out the gorgeous presentation of these dishes. I love the pops of colour, and the generous servings. We ordered two savoury dishes and a dessert to share. This is one of my favourite brunch dishes, and something I often make at home (for breakfast & dinner). So I have high standards when it comes to Shakshuka!! Little Byrd’s version is comforting, filled with fragrant spices and lots of turkish sausage. A pleasure to eat – and something I would order again. A fluffy warm pita topped with marinated chicken, greek salad and tzaziki. This was a massive serving, and super flavourful. The chicken was juicy, the salad was fresh, crunchy and salty from the feta, and the sauce was creamy. Loved it. Look at this beauty. This has to be the best french toast ($18) I have ever had. On the plate: several toast pieces, which were lighly caramelised on the outside, so there was a sugar crunch when you bit into the fluffy sweet goodness. There were berries, oreo crumbs, and broken oreo pieces, plus mascapone. Pop that all together on your fork and you are in sweet tooth heaven. We seriously loved our experience at Little Byrd : it is a northside gem. The service was friendly, the space was welcoming and the food was really great value, plus delicious. There were so many great things on the menu to choose from, plus they have an all day breakfast. 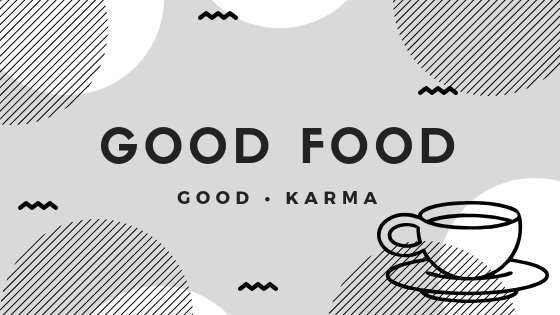 Disclaimer: Goodfoodgoodkarma was invited by Little Byrd to try their menu, free of charge. All opinions are our own. I’ve been wanting to visit this place for forever. I’ve always walked past it on the way to the 96 tram stop which is basically outside the door. So I was excited when I recieved an invitation to check out their menu. Yay!! Gyoza Douraku is a classic Japanese izakaya-style eatery. The menu is built around the idea of tapas to enjoy with their massive drinks list. The majority of the tapas are priced at $6.80, which makes it easy to try a heap of different dishes affordably. We went for dinner and ordered some dishes to share, and really enjoyed every single one. Not one dud dish, which doesn’t happen too often. We started with some Gyoza, which of course is one of their specialities. They have quite a few different fillings, and a whole section of the menu is dedicated to delicious sounding gyoza. We tried the Angus beef & red onion, and the mixed vegetables & potato. I love gyoza with slighty crispy edges that arent too oily and flavourful fillings which aren’t just mystery mush : these were really yum. We also ordered a serving of tamago yaki with truffle sauce- this was a fluffy rolled omlette and the unami factor was x10 when it was dipped into the sauce. A must order dish – we loved it. We asked for a reccomendation from our lovely waiter, and she suggested the chicken yakitori. This chicken was juicy and perfectly cooked: the glaze was sticky and slightly sweet. Another menu highlight! We also ordered some deep fried burdock root chips. Something weird about me: I only like thinly cut potato fries, which are really crispy, but these are hard to find – most potato fries are fluffy on the inside and thick cut. So these super thin and super crispy burdock root fries a great find for me! Omg: such a satisfying crunch. I am obsessed with onigiri, so these Chargrilled rice balls with miso were right up my alley. The crispy/chewy char-grilled edges, slightly sweet from the miso = yummmmmm. You know I’m obsessed with Matcha: so I COULD NOT RESIST the matcha parfait. There were two different softserve flavours to choose from (Matcha & Houjicha) and a few different types of parfait. We got the chocolate themed parfait: with choc chip cookies and rice bubbles ( I think it was meant to have chocolate mousse in it as well, but that didn’t appear in mine). It was awesome – crunchy cookies and rice bubbles and a really strong matcha softserve – a great mix of texture, sweetness and slight bitterness from the tea. Plus it looked so pretty. Summary: this izakaya has a real buzzing atmosphere, and a dark but cosy feel. I think it would be a great place for a date or to catch up over some drinks and tapas with friends. The food is really delicious, and the menu has heaps of authentic Japanese street food style dishes that you would not normally see elsewhere : plus it is all really well priced. Staff were attentive and friendly, plus happy to give recomemdations. This is a great, budget friendly Japanese tapas place. Disclaimer: We were invited by Gyoza Douraku to try their menu. Our opinions are our own and the restaurant owners did not influence our review.